Seeking a cook with minimum of 5 years experience in fast pace high end restaurants. Must be skilled at time management, know cook times & when to fire each item in a timely manner. Able to follow recipes consistently. Upscale southern cuisine restaurant. Must be familiar using smokers, fryer, flat tops, pizza oven, mixers, steamers, etc. ServSafe Food Handler card required (manager ServSafe preferred). Fluent in reading & writing English, bilingual a plus (Spanish).<br><br>1st open interview is Thurs Dec 6th 6pm-8pm. Other interviews will be scheduled 1 on 1 via Harri scheduling app. 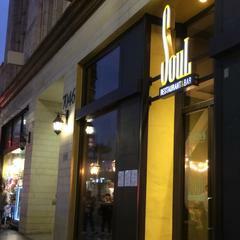 Soul Hollywood Restaurant & Bar is posting their hospitality jobs on Harri.